Singapore Historian Thum Pingtjin Called Out For Spreading Fake News About Lee Kuan Yew’s 1985 Speech To US Congress; Debunked By His Online Followers – Sinking It In! Singaporean Historian Dr Thum Pingtjin on Monday night (2nd July 2018) shared two cartoons depicting starkly scenes of former Prime Minister Lee Kuan Yew’s address to US Congress in 1985. As the International Herald Tribune reported LKY’s address as poorly attended and only received polite applause, Dr Thum questioned if LKY’s global reputation was manufactured by the Singaporean mainstream media. Dr Thum was quickly debunked by netizens who provided irrevocable video evidence. Hmmm… now I’m wondering just how much of what Singaporeans believed to be LKY’s vaunted global reputation was actually manufactured by the government-controlled media, in the days when there were no alternative news sources? 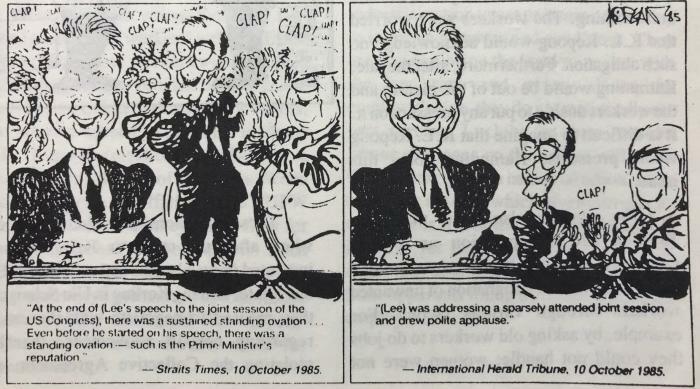 “At the end of (Lee’s speech to the joint session of the US Congress), there was a sustained standing ovation… Even before he started his speech, there was a standing ovation – such is the Prime Minister’s reputation.” – Straits Times, 10 October 1985. “(Lee) was addressing a sparsely attended joint session and drew polite applause.” – International Herald Tribune, 10 October 1985. In response to Dr Thum’s questioning the veracity of local media’s portrayal of LKY’s audience, netizens shared actual video clips of LKY’s speech to congress; in the process answering Dr Thum’s doubts to the authenticity of local media reports. In the youtube video clip, it showed a congress packed full of attendees and Lee Kuan Yew’s receiving a rousing applause for his speech. This is in contrast to the International Herald Tribune’s dubious reporting that the session was sparsely attended and drew only polite applause. For reasons unknown, the IHT in 1985 chose to report in such a deflated tone when the video evidence proves otherwise. You may wish to check out the video for yourselves below. As an esteemed Oxford academic who is well-versed in thorough methods of research, Dr Thum appears to have jumped the gun when he pronounced mainstream media as sycophants of Lee Kuan Yew. Hopefully, Dr Thum’s future assertions can stand up to better scrutiny by his followers and uphold his reputation as an academic with integrity.